I will be preaching at the UNITY BAPTIST CHURCH of Corsicana, TX, Sunday. This church is pastored by my friend Pastor Chad Owens. This pastor has one of the most interesting stories concerning soul winning and missions I have ever heard. I will be relating that to you tomorrow. I want to make sure I have the latest stats on the influence of one independent Baptist church on a foreign nation. It is an amazing story! I would like for you to mark April 8-10, 2012, on your calendars please. The INDEPENDENT BAPTIST CONFERENCE is coming to the Milwaukee, WI, area. Dr. Dean Noonan who pastors the FAITH BAPTIST CHURCH of Oak Creek, WI, will be hosting the conference. I want you to meet one of the best men of God I have ever met in my 40 years of ministry. Dr. Paul Duckett Sr.! 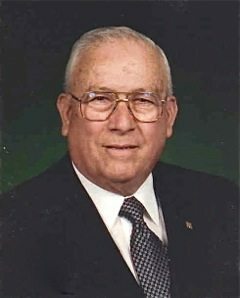 His son Dr. Paul Duckett Jr. worked on my staff for 18 plus years and was of the finest God ever made. His son was a spirit-filled man of God who excelled in being a servant and gave us the best music a ministry could experience. Dr. Paul Duckett Sr. would conduct our music for our NATIONAL SOUL WINNING CLINICS. It was excellent music! Dr. Paul Duckett Sr. was on the staff of Dr. J. Frank Norris, one of the fathers of the independent Baptist movement. He led the singing for J. Frank Norris as well as leading the singing for Dr. Norris’ school and conferences for preachers. Dr. Duckett Sr. has been in the ministry for 67 years. You have never been in better congregational singing in your life than that conducted by this seasoned man of God. Your mind, heart, and soul will be blessed! He is old school, which will make him different than any song leader you have ever heard, unless you have heard this man. We need spirit-filled singing and singers as well as preachers in our pulpits. This music will not highlight a man but will highlight the Holy Spirit! The first 50 pastors who call 414-301-9319 to pre-register will receive free motel accommodations for Monday and Tuesday. The conference is free and the materials handed out will be free. Classes will be conducted Tuesday beginning at 9 am for pastors and staff conducted by myself, layman conducted by Dr. Russell Anderson, ladies conducted by Mrs. Dean Noonan, and youth conducted by Youth Pastor Matt Kielas. There will be a free luncheon at noon hosted by Dr. Russell Anderson. All are invited with an emphasis for layman who are interested in starting a business. 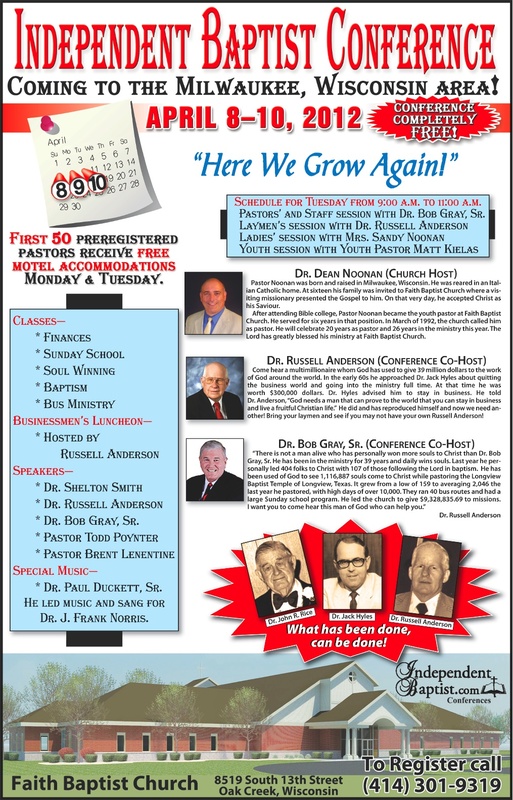 There have been 14 businesses started at LONGVIEW BAPTIST TEMPLE because of the influence of Dr. Russell Anderson. A couple of those men will be giving testimonies at the luncheon. Behind every great revival in America there was a spirit-filled man of God. Behind every one of those men of God was a spirit-filled layman of God. There is a need for Nehemiahs to come to the forefront of the local church. This combination is needed in every local church. BRING your laymen and allow them to be helped by a Kentucky coal miner who ended up running 7 businesses and giving 39 million dollars to independent Baptist works with 8 million given in one day alone. Pastor, you cannot do this alone. We must learn the Bible principles used by Dr. Anderson before he goes to Heaven. He is 80 going on 81 and our laymen must garner these principles before he dies! WHAT HAS BEEN DONE CAN BE DONE!